Artikel-Nr. : 12098 This machine has a new owner. But no problem: Below you can find similar machines we have in stock. Morooka MST2000 crawler dumper used weight 11700 kg max. pay load 8000 kg measurements: total length appr. 5430 mm total width appr. 2700 mm total height appr.2500 mm Gummiketten width 800 mm Spurbreite appr. 1900mm engine: Komatsu diesel engine water cooling engine 233PS 2600U/min data: starter 24volt hydraulic pump pressure appr. 165 bar brake pressure appr. 9,5 bar 2 hydraulic-Dump cylinder double action Kolbenstange appr. 70 mm turning radius min. 2,8 meter ground pressure appr. 140 g/cm² tipping angle appr. 58° Steigfähigkeit appr. 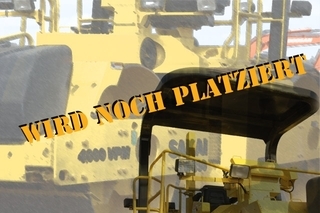 35° equipment: Gummiketten cab Kippmulde dump body CE-marking This Morooka rubber track carrier video zeigt one Morooka MST 2000 in use in any Baustelle. Diese rubber track carrier eignen sich good for weiche ground or in moor to fahren.